If you want a vanity that is both stylish and useful, this traditional vanity is perfect. Made with a special white solid wood base and a white marble counter, this piece will make your bathroom look even nicer. With drawers and double-door cabinet, this vanity set is also great to keep items in. Put together your perfect bathroom with this stylish vanity set from Wyndham Collection. For some added classic style in your bathroom, choose this beautiful vanity. The good-looking beige tan marble counter and black solid wood base make a big difference in your bathroom. The single-door cabinet and drawers are great for putting away bathroom items. Put a nice touch on your bathroom's look with this vanity set from Wyndham Collection. With its double sinks and compact size, the Arrano 55-inch Vanity in Espresso with Glass Vanity Top in White with White Basin and Mirror is ideally suited for small master baths. 4 doors and 3 drawers provide ample storage space to hide toiletries and extra towels while keeping the counter uncluttered. Brushed chrome hardware, single faucet mounts and a large horizontal mirror give the Arrano a modern look that will complement any contemporary bathroom. Berkeley 72-inch W 4-Drawer 2-Door Vanity in White With Marble Top in White, Double Basins If you want a vanity that is both stylish and useful, this traditional vanity is perfect. Made with a special white solid wood base and a white marble counter, this piece will make your bathroom look even nicer. With drawers and double-door cabinet, this vanity set is also great to keep items in. Put together your perfect bathroom with this stylish vanity set from Wyndham Collection. 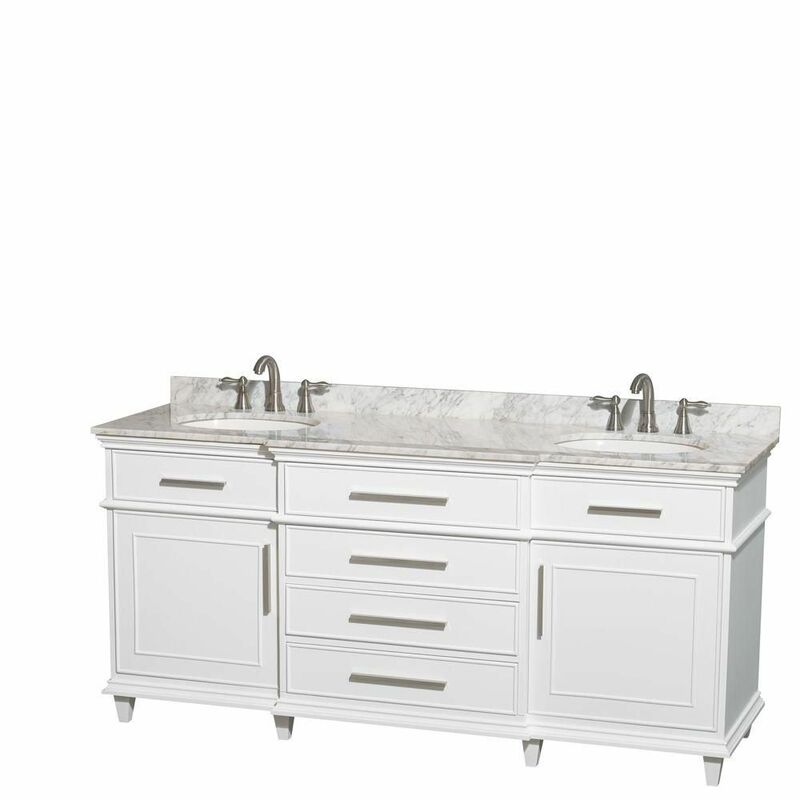 Berkeley 72-inch W 4-Drawer 2-Door Vanity in White With Marble Top in White, Double Basins is rated 5.0 out of 5 by 6. Rated 5 out of 5 by BTL from It's a great value for the piece - ample storage,... It's a great value for the piece - ample storage, good design. Soft-close drawers are a little stiff but should loosen with use. Piece came in perfect condition - I paid for inside delivery and they did a great job; were careful with the unit and my floors and even hauled away the packaging. Rated 5 out of 5 by Emily from The vanity arrived well packed and is prettier than... The vanity arrived well packed and is prettier than online. It is well constructed and I am sure will last for many years to come. The 4 spacious drawers offer a lot of storage space as do the 2 cabinets. Rated 5 out of 5 by shelby from love the style so happy with my purchase. well made. exceptional workmanship.